How does the CliniMACS Plus Instrument work? The CliniMACS® Plus Instrument utilizes a reagent consisting of an antibody that specifically binds to a specific surface marker on the target cell. The antibody is conjugated to an iron-containing particle that is only nanometers in size and biocompatible. 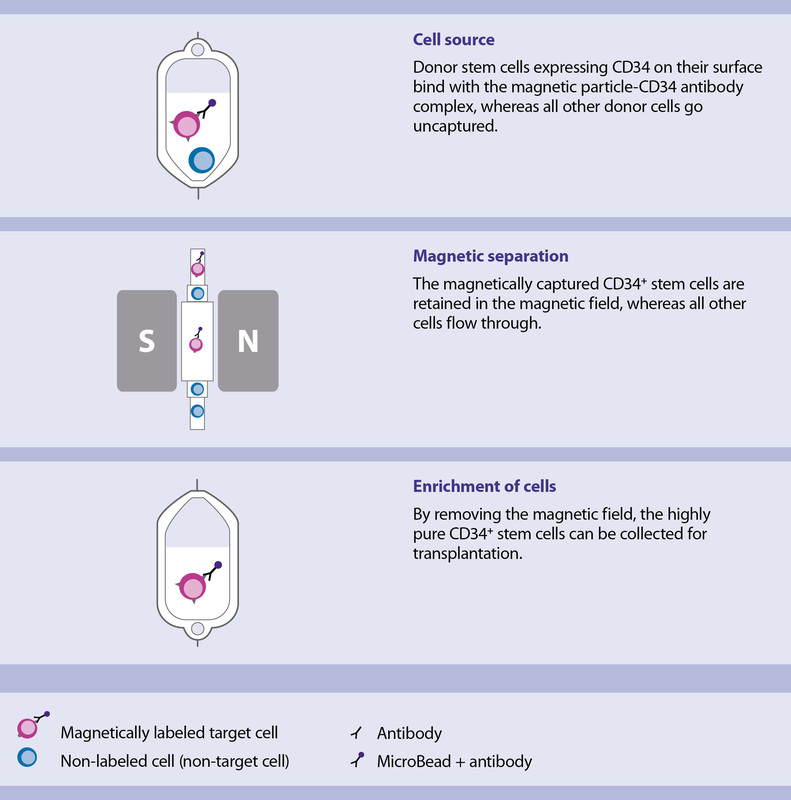 The enrichment of target cells or depletion of unwanted cells is accomplished by passing the antibody/magnetically-labeled cell suspension through a magnetic separation column, which is provided as part of a single-use disposable tubing set. Labeled cells are retained within the separation column, while unlabeled cells flow through. Recovery of enriched cells is achieved by removing the magnetic field and eluting the targeted cells into a collection bag. Single-use Tubing Sets for the CliniMACS® Plus Instrument are sealed, pre-assembled tubing packs for magnetic cell separation. The individual CliniMACS Separation strategy determines which CliniMACS Tubing Set should be selected. The CliniMACS® Plus Instrument enables clinical-scale separations for a variety of cells, including hematopoietic stem cells, mesenchymal stem cells, monocytes, DCs, NK cells, B cells, and T cell subsets, for use in the fields of regenerative medicine, adoptive immunotherapy, and graft engineering.